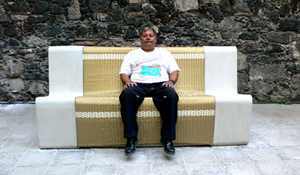 Sonic Bench_Mexico is the original sonic bench. Commissioned by Im-polis for Transitio mx_02, Nomadic Borders, it was constructed at the Arte Alameda with Kaffe Matthews in residence in Mexico City. Sonic Bench_Mexico opened there on October 13th, 2007, and is available now for sitting in the courtyard daily and permanently, free. Inspired by the success of the ongoing Worldwide Bed Project, Sonic Bench is a new and outdoor venue made through the ongoing collaborative research of music for bodies. Being an outdoor work and one for sitting, Bench maintains the audio power and spatiality of the Sonic Beds but is ultimately more accessible to the passer by. Bench is also an instrument which composers or anyone interested could be commissioned to make new pieces for it. Its internal computer will store these works so allowing easy selection for sitters as required. A future intention is for Bench to be linked to the internet from where a growing library of international Bench works could be downloaded. 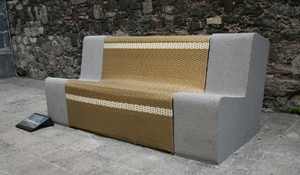 Sonic Bench_Mexico (2007) was designed by Kaffe Matthews in collaboration with Grant Reid, Interiorist, London, upholstery consultation Mandy McIntosh and software instrument development as ever in the ongoing collaboration with artist designer David Muth. Its music was made by Kaffe Matthews sitting in the bench whilst in residence in Mexico City October 2007. New works are now being commissioned for Bench in 2008. If you are interested to make one in any way, please contact us now.